Color over Angle (CoA) variation in the light output of white phosphor-converted LEDs is a common problem in LED lighting technology. In this article we propose an inverse method to design an optical element that eliminates the color variation for a point light source. The method in this article is an improved version of an earlier method by the same authors, and provides more design freedom than the original method. We derive a mathematical model for color mixing in a collimator and present a numerical algorithm to solve it. We verify the results using Monte-Carlo ray tracing. LED is a rising technology in the field of lighting. In the past, LEDs were only suitable as indicator lights, but the enormous improvements in energy efficiency, cost and light output now allow the use of LEDs for lighting applications . Additionally, LED lighting benefits from low maintenance cost and long lifetime. Because LED is a rising technology, companies and researchers are constantly searching for methods to reduce the production cost and increase the efficiency, light output and light quality of LED-based lamps. An important issue for white LED lamps is color variation of the emitted light. This is caused by color variation in the light output of the most common type of white LED, the phosphor-converted LED. This type of LED consists of a blue LED with on top a so-called phosphor layer which converts part of the blue light into yellow and red. The resulting output is white light. The distance that a light ray travels through the phosphor depends on the angle of emission. As a result, the light emitted normal to the LED surface is more bluish, while the light emitted nearly parallel to the surface is more yellowish [, pp.353-357]. This phenomenon is called Color over Angle (CoA) variation. A lot of research has been done to reduce this color variation. Introduction of bubbles in the phosphor layer causes scattering of light, reducing the color variation . Another common method is the application of a dichroic coating on the LED . However, these methods reduce the efficiency of the LED and increase the production costs. Wang et al. proposed a modification of the optics on the LED to improve the color uniformity. In the case of a spot light, the LED is combined with a collimator. A collimator is an optical component that reduces the angular width of the light emitted by the LED. A common technique is to add a microstructure on top of the collimator. However, this microstructure introduces extra costs in the production process of the collimator, makes the collimator look unattractive and broadens the light beam. None of the methods mentioned above rigorously solve the problem of color variation, and all methods reduce the efficiency of the optical system. In earlier work , we introduced an inverse method to design a specific type of collimator, the so-called TIR (total internal reflection) collimator. The TIR collimator designed with this method mixes light from a point source such that the color variation is completely eliminated. The collimator requires no microstructures nor scattering techniques. However, the inverse method left very little design freedom for optical designers. An optical designer wants to influence the height and width of the collimator, for example, to fit it into the available space in a lamp design. Also, optical designers want a color mixing collimator which resembles a standard collimator as closely as possible. The inverse method introduced in this paper is an improvement of the method introduced in . The collimator has three free surfaces instead of two. As a result, the improved method offers more design freedom, and it is nearly impossible to distinguish the resulting collimator with the naked eye from a collimator without color correction. The contents of this paper is the following. First we give a thorough introduction to inverse methods for optical systems and the theory of color mixing in Section 2. In Section 3 we explain the improved inverse method. Section 4 describes three examples where the new method is used. Finally, we end with concluding remarks in Section 5. A TIR collimator is a rotationally symmetric lens, usually made of a transparent plastic like polycarbonate (PC) or polymethyl methacrylate (PMMA), that is used to collimate the light of an LED into a compact beam. A profile of a TIR collimator can be seen in Figure 1. 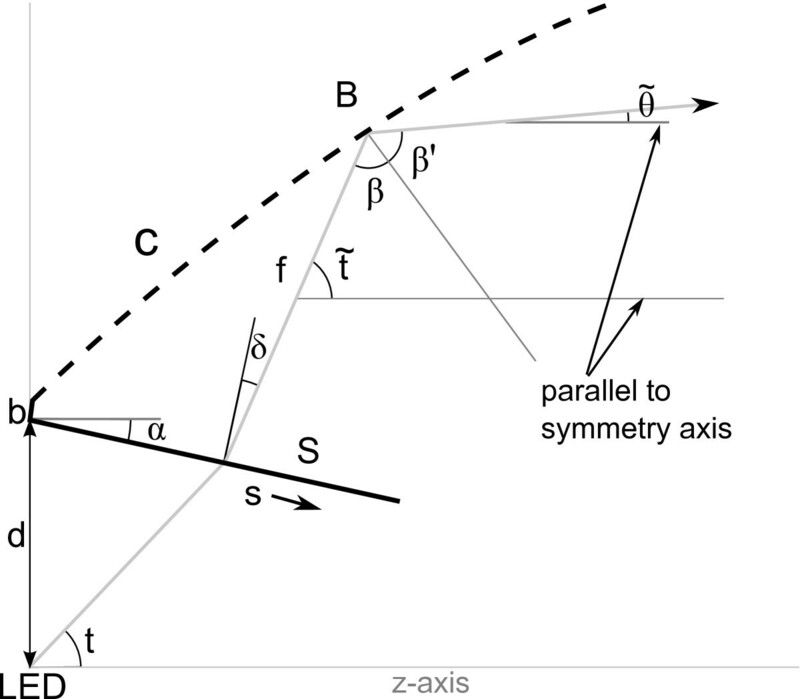 The design procedure using inverse methods consists of two steps: first we choose a relation between the angles t of rays leaving the LED and the angles θ of rays leaving the collimator, the so-called transfer functions. Subsequently we use these transfer functions to calculate the free surfaces of the TIR collimator such that the light is redirected according to the relation defined by the transfer functions. In Figure 1 these free surfaces are denoted by A, B and C.
Profile of a TIR collimator. A full TIR collimator can be obtained by rotating the profile around the z-axis. Surface B and C are separated by the ray with angle θ = 0 . I ( t ) = 1 2 π ∫ 0 2 π I ( t ) sin ( t ) d u = I ( t ) sin ( t ) . The effective intensity has unit [lm/rad]. For an LED, the effective intensity is typically positive for t ∈ ( 0 , π / 2 ) . ∫ 0 π / 2 I ( t ) d t = c ∫ 0 θ max G ( θ ) d θ .
where σ i = − 1 for monotonically decreasing transfer functions and σ i = 1 for monotonically increasing transfer functions. The second requirement on transfer functions is related to the color of the resulting beam from the collimator. First we give a short introduction to the theory of color perception, then we derive an ordinary differential equation describing the color of the beam. y = L 1 + L 2 L 1 / y 1 + L 2 / y 2 . The resulting chromaticity coordinates are weighted averages of the chromaticity coordinates of the original beam with weights L 1 / y 1 and L 2 / y 2 . Note that a point ( x , y ) is on the straight line segment between ( x 1 , y 1 ) and ( x 2 , y 2 ) . y T = ∑ i = 1 N σ i I ( η i ( θ ) ) d η i ( θ ) ∑ i = 1 N σ i I ( η i ( θ ) ) / y ( η i ( θ ) ) d η i ( θ ) . ∑ i = 1 N σ i I ( η i ( θ ) ) y ( η i ( θ ) ) η i ′ ( θ ) = c G ( θ ) / y T .
Scatter plot of the measured x and y chromaticity coordinates of the LED used in the numerical experiments in this article. The size of the circles corresponds to the effective intensity. The measured data in the lower left corner correspond small angles of t. The measured data for values of t close to π / 2 around ( 0.423 , 0.4 ) are unreliable because of the low light intensities, causing the irregularity. d f d s = d t ˜ d s tan ( β ) f + ( tan ( β ) cos ( δ ) + sin ( δ ) ) . d f d t = d t ˜ d t tan ( β ) f + d s d t ( tan ( β ) cos ( δ ) − sin ( δ ) ) . The parameters β and δ depend on t and are derived below. Geometry of the free surfaces B and C. The grey arrow shows the ‘TIR route’ of the light. Light propagates through the collimator by two type of routes. In the ‘TIR route’, light is refracted by surface S, reflected by surface B or C by total internal reflection and finally refracted by surface T. In the ‘lens route’, light is refracted by surface A and subsequently refracted by surface T.
t ˜ ( t ) = arccos ( cos ( α + t ) n ) − α .
δ ( t ) = t ˜ ( t ) + α − π 2 .
β ( t ) = 1 2 ( t ˜ ( t ) − θ ˜ ( t ) − π ) . y B / C ( t ) = y S ( t ) + f ( t ) sin ( t ˜ ( t ) ) . tan ( β ) = sin ( θ ˜ − t ˜ ) 1 / n − cos ( θ ˜ − t ˜ ) . f ( τ 1 ) = x S ( τ 1 ) 2 + y S ( τ 1 ) 2 .
y A ( t ) = f ( t ) sin ( t ) . ( I 1 ( θ ) − I 2 ( θ ) I 3 ( θ ) I 1 ( θ ) / y 1 ( θ ) − I 2 ( θ ) / y 2 ( θ ) I 3 ( θ ) / y 3 ( θ ) ) ( η 1 ′ ( θ ) η 2 ′ ( θ ) η 3 ′ ( θ ) ) = c G ( θ ) ( 1 1 / y T ) . η 1 ( θ max ) = τ 1 , η 2 ( θ max ) = τ 1 , η 3 ( θ max ) = π / 2 .
σ j I j ( θ ) η j ′ ( θ ) = r c G ( θ ) . ( I 1 ( θ ) − I 2 ( θ ) I 3 ( θ ) I 1 ( θ ) / y 1 ( θ ) − I 2 ( θ ) / y 2 ( θ ) I 3 ( θ ) / y 3 ( θ ) 0 − I 2 ( θ ) 0 ) ( η 1 ′ ( θ ) η 2 ′ ( θ ) η 3 ′ ( θ ) ) = c G ( θ ) ( 1 1 / y T r ) . η 3 ′ ( θ ) = c G ( θ ) I 3 ( θ ) y 3 ( θ ) y 3 ( θ ) − y 1 ( θ ) ( 1 − r − y 1 ( θ ) y T + r y 1 ( θ ) y 2 ( θ ) ) . The system (22a)-(22c) with boundary conditions (19a) and (19b) has three unknown functions η 1 ( θ ) , η 2 ( θ ) and η 3 ( θ ) . The functions I ( t ) and y ( t ) are known from measurements on the LED. 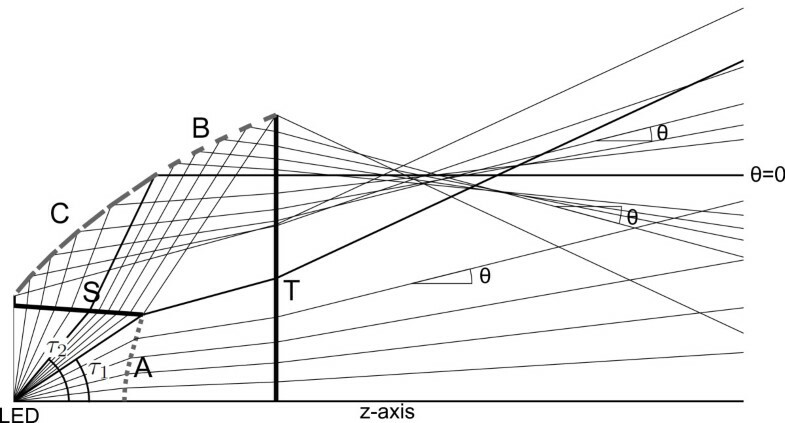 The function G ( θ ) can be chosen by the optical designer as a finite function on [ 0 , θ max ] . The constants c, y T and r cannot be chosen freely, we will show that their values follow from conservation of luminous flux, the law of color mixing and the choice of τ 1 and τ 2 , respectively. Also the values of τ 1 and τ 2 cannot be chosen freely, we will derive an inequality that guarantees monotonicity of the transfer functions. η 1 ′ ( 0 ) = c G + ′ ( 0 ) I + ′ ( 0 ) y 1 ( 0 ) y 1 ( 0 ) − y 3 ( 0 ) ( 1 − y 3 ( 0 ) y T ) . We choose the positive sign in front of the square root since η 1 ′ ( 0 ) should be positive. Here G + ′ ( 0 ) and I + ′ ( 0 ) are the right derivatives of G ( θ ) at θ = 0 and of I ( t ) at t = 0 , respectively. These right derivatives are positive because I ( t ) and G ( θ ) are positive at t > 0 and θ > 0 . We have y ( t ) > 0 by definition of chromaticity coordinates, and we assume based on measurements that y ( τ 1 ) < y ( τ 2 ) and thus y 1 ( 0 ) < y 3 ( 0 ) . From this we see that we need to choose τ 2 such that y ( τ 2 ) > y T , so the right hand side of (23) is positive and real. The system (21) with boundary conditions (19a) and (19b) appears to be overdetermined. However, the system contains three unknown parameters which still need to be chosen. We derive values for three constants c, y T and r given the boundary conditions and assuming monotonicity of the transfer functions. Later we show that our choice of the constants c, y T and r imply that three of the boundary conditions are superfluous. c ∫ 0 θ max G ( θ ) d θ = ∫ 0 θ max ∑ i = 1 3 σ i I i ( θ ) η i ( θ ) d θ = ∫ 0 π / 2 I ( t ) d t .
The function I ( t ) is known from measurements on the LED, the function G ( θ ) is chosen by the optical designer, so from this relation we derive the value of the constant c. This relation corresponds to conservation of luminous flux (equation (2)). 1 / y T ∫ 0 π / 2 I ( t ) d t = ∫ 0 π / 2 I ( t ) / y ( t ) d t .
This relation shows that y T is the weighted harmonic average of the y-chromaticity coordinate of the light source. Like I ( t ) , the function y ( t ) is known from measurements on the LED, thus we can derive the value of y T .
r ∫ 0 π / 2 I ( t ) d t = ∫ τ 1 τ 2 I ( t ) d t .
This relations corresponds to conservation of luminous flux for the second transfer function. The transfer functions calculated from (22a)-(22c) should be monotonic, otherwise they have no physical meaning. From (22b) we can easily see that η 2 ′ ( θ ) ≤ 0 because r > 0 , G ( θ ) ≥ 0 and I ( t ) ≥ 0 , thus, η 2 ( θ ) is monotonically decreasing. The monotonicity of η 1 and η 3 is more complicated to show and we need some additional assumptions to derive a sufficient condition for monotonicity. 0 ≤ η 1 ( θ ) ≤ τ 1 , τ 1 ≤ η 2 ( θ ) ≤ τ 2 , τ 2 ≤ η 3 ( θ ) ≤ π / 2 .
then η 1 ( θ ) and η 3 ( θ ) are monotonically increasing. 1 − r − y 1 ( θ ) y T + r y 1 ( θ ) y 2 ( θ ) ≥ 0 .
t − 1 y T ( y 3 ( θ ) − y 1 ( θ ) ) + r y 2 ( θ ) ( y 3 ( θ ) − y 1 ( θ ) ) ≤ 0 .
r y 2 ( θ ) ≤ 1 y T .
M ( θ ) = 1 − r 1 / y T − r / y 2 ( θ ) . y 1 ( θ ) ≤ M ( θ ) ≤ y 3 ( θ ) . 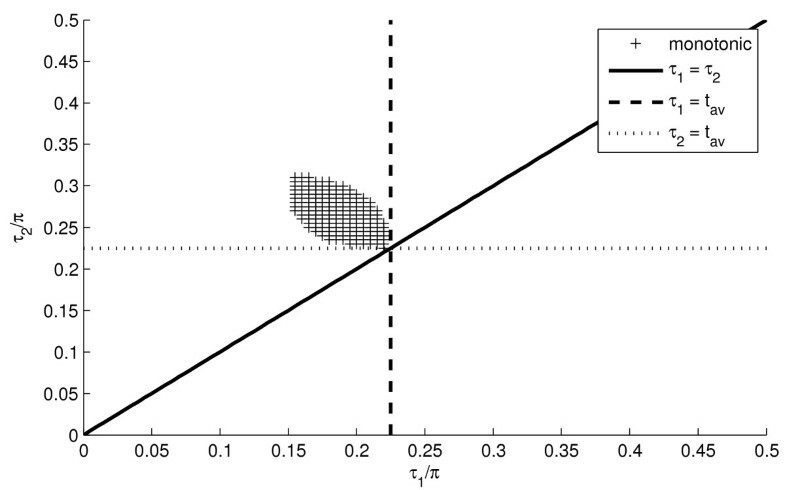 Figure 4 shows a scatter plot of values of τ 1 and τ 2 for which (29) is satisfied for an LED which was also used in the numerical experiments. The acceptable values of τ 1 and τ 2 are bounded by the lines τ 1 = t av and τ 2 = t av , where t av is the such that y ( t av ) = y T . In this case, the value of t av is unique. From (29) we see that τ 1 > t av results in y ( τ 1 ) > y T , and thus r < 0 . Therefore we cannot guarantee the monotonicity of the transfer functions. Using (22c) we can verify that indeed the third transfer function is not monotonic at θ = θ max . Similarly, τ 2 < t av results in r < 0 , and we can verify using (23) that the first transfer function is not monotonic at θ = 0 . Scatter plot of the values of τ 1 and τ 2 for LED16 that guarantee monotonic transfer functions. t av is such that y ( t av ) = y T .
The ODE-system (21) with the boundary conditions (19a) and (19b) can be solved as an initial value problem. We remark that solving the system as an end value problem has no advantages or disadvantages. We discard the end conditions and solve the initial value problem using a Runge-Kutta method. The end conditions are satisfied as a result of our choices of c, y T and r.
Theorem 2 Assume monotonicity of the transfer functions. The solution of the initial value problem defined by the ODE system (21) and the initial conditions η 1 ( 0 ) = 0 , η 2 ( 0 ) = η 3 ( 0 ) = τ 2 satisfies the end conditions η 1 ( θ max ) = η 2 ( θ max ) = τ 1 , η 3 ( θ max ) = π / 2 . − ∫ 0 θ max I 2 ( θ ) η 2 ′ ( θ ) d θ = − ∫ τ 2 η 2 ( θ max ) I ( t ) d t = r c ∫ 0 θ max G ( θ ) d θ = ∫ τ 1 τ 2 I ( t ) d t .
∫ τ 2 η 2 ( θ max ) I ( t ) d t + ∫ τ 1 τ 2 I ( t ) d t = 0 . Because I ( t ) > 0 for all t except for two points at the boundary, we can conclude η 2 ( θ ) = τ 1 . Note that this implies τ 1 ≤ η 2 ( θ ) ≤ τ 2 . ∫ 0 θ max ( I 1 ( θ ) η 1 ′ ( θ ) − I 2 ( θ ) η 2 ′ ( θ ) + I 3 ( θ ) η 3 ′ ( θ ) ) d θ = ∫ 0 η 1 ( θ max ) I ( t ) d t − ∫ τ 2 τ 1 I ( t ) d t + ∫ τ 2 η 3 ( θ max ) I ( t ) d t .
c ∫ 0 θ max G ( θ ) d θ = ∫ 0 π / 2 I ( t ) d t .
∫ τ 1 η 1 ( θ max ) I ( t ) y ( t ) d t + ∫ π / 2 η 3 ( θ max ) I ( t ) y ( t ) d t = 0 . ∫ τ 1 η 1 ( θ max ) I ( t ) d t = 0 , ∫ π / 2 η 3 ( θ max ) I ( t ) d t = 0 .
η 1 ( θ max ) = τ 1 , η 3 ( θ max ) = π / 2 . We solved the mathematical model described in the previous section to design three different TIR collimators. The collimators were designed for two different LEDs, which we refer to as LED16 and LED02. Both of them are Luxeon Rebel IES white LEDs without a dichroic coating, and have a larger than usual CoA variation. The intensity and chromaticity-coordinates of the LEDs were measured, and the measured data were interpolated. The interpolation polynomials have been used to approximate I ( t ) and y ( t ) in (22a)-(22c). The first two collimators were designed for LED16 and have a Gaussian-shaped target intensity profile. The two collimators differ in their values for τ 1 and τ 2 . The third collimator was designed for LED02 and has a block-shaped target intensity profile. The collimators were evaluated using the LightTools software package . I ( t ) = ∑ i = 2 7 C i ( t i − ( π / 2 ) i ) , x ( t ) = D 0 x + ∑ i = 2 7 D i x t i , y ( t ) = D 0 y + ∑ i = 2 7 D i y t i . The polynomial for the intensity was chosen because it equals 0 at t = π / 2 and has zero derivative at t = 0 , both properties are characteristic for the intensity distribution of an LED. The effective intensity equals I ( t ) = sin ( t ) I ( t ) . The polynomials for the chromaticity coordinates were chosen because their derivative equals 0 at t = 0 . The coefficients for the two LEDs can be found in Table 1. In the LightTools software package, two three-dimensional models were built to simulate the LEDs. The range ( 0 , π 2 ) of the angle t was discretized into 46 different subintervals, labeled k = 1 , 2 , … , 46 . For k = 1 we have the interval ( 0 , π 180 ) , for k = 2 , … , 45 we have ( ( 2 k − 3 ) π 180 , ( 2 k − 1 ) π 180 ) and finally for k = 46 we have ( 89 π 180 , π 2 ) . The intensity and chromaticity coordinates of the LED models in these subintervals correspond to the measured data of the real LEDs at the angles t = ( 2 k − 2 ) π 180 . 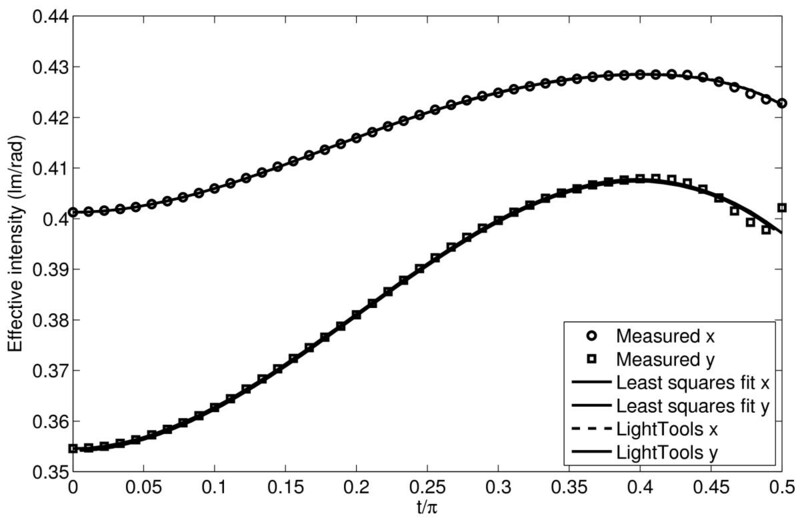 The size of the LED model was reduced to 0.01 mm by 0.01 mm to simulate a point light source. A comparison of the measured data, the least squares fit and the raytracing results of the LightTools model of LED16 without collimator can be seen in Figures 5 and 6. 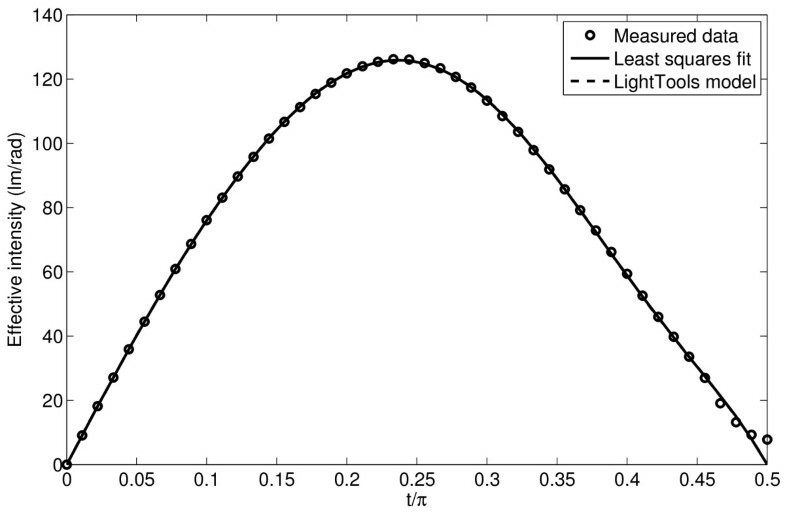 A scatter plot of the measured x and y chromaticity coordinates for this LED was shown earlier in Figure 2. 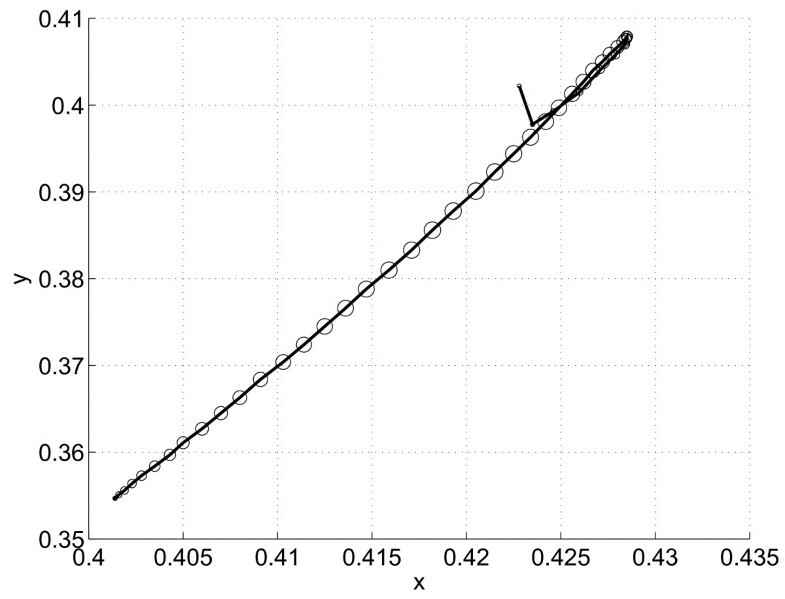 The plot shows the near-linear relationship between x and y, indeed. 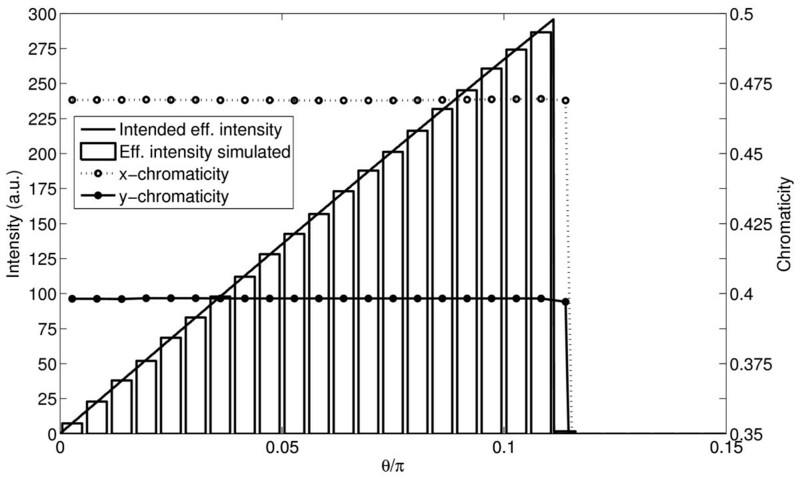 Comparison of the measured effective intensity , the least squares fit and the LightTools model of LED16. The graph of the LightTools model is not visible because it is hidden behind the least squares fit. Comparison of measured chromaticity coordinates x and y , the least squares fit and the LightTools Model of LED16. The graph of the LightTools model is not visible because it is hidden behind the least squares fit. with 0 ≤ θ ≤ 1.25 θ FWHM = θ max , θ FWHM = π / 9 . The collimator was designed for LED16. The choice of τ 1 and τ 2 is restricted by (29). This relation is highly nonlinear. A scatter plot of values of τ 1 and τ 2 that satisfy (29) for LED16 is shown in Figure 4. We chose τ 1 = 0.2 π and τ 2 = 0.25 π . The second collimator was designed for the same LED and target intensity, but this time we chose τ 1 = 0.16 π and τ 2 = 0.3 π , which gives a larger second segment. The third collimator was designed for LED02. The target intensity was chosen to be a block function, yielding the effective intensity G ( θ ) = sin ( θ ) , with 0 ≤ θ ≤ θ max = π / 9 . We chose τ 1 = 0.2 π and τ 2 = 0.25 π , which satisfies (29). An overview of the values chosen and calculated for the three collimators is shown in Table 2. The ODE system (22a)-(22c) with initial conditions (19a) was solved using the ODE-solver ode45 in Matlab. The calculation times were a few seconds on a laptop computer with a 2.4 GHz processor and 4 GB RAM. The calculated transfer functions are shown in Figure 7, 8 and 9. The transfer functions are indeed monotonic, as expected. Also, η 1 ( θ max ) = η 2 ( θ max ) = τ 1 and η 3 ( θ max ) = π / 2 , as anticipated. Transfer functions for the collimator with Gaussian profile and a small second segment. Transfer functions for the collimator with Gaussian profile and a large second segment. 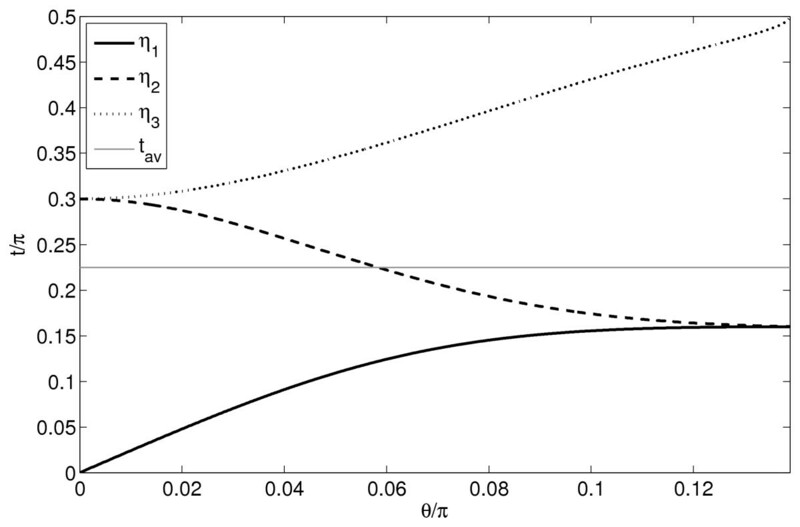 Transfer functions for the collimator with block profile. Subsequently, a TIR collimator was designed for each set of transfer functions, and evaluated using LightTools. We chose for all the collimators d = 4 mm , b = 0.4 mm and α = 4 π / 180 . For every collimator, each free surface was discretized using 500 points and converted into a LightTools model. A screenshot of the LightTools model of the first collimator can be seen in Figure 10. Results of the simulations can be seen in Figures 11, 12 and 13. In these figures, we see the expected profiles of the effective intensity and chromaticity. Figures 11 and 12 look very similar, because the first and second collimator were designed with the same output specifications. In these figures, an irregularity is visible in the chromaticity coordinates near θ = θ max . This can be explained as follows. Every bar in the graph corresponds to a range of one degree ( π / 180 rad ). We chose θ max = 25 π / 180 , and thus the flux at this angle should be zero. 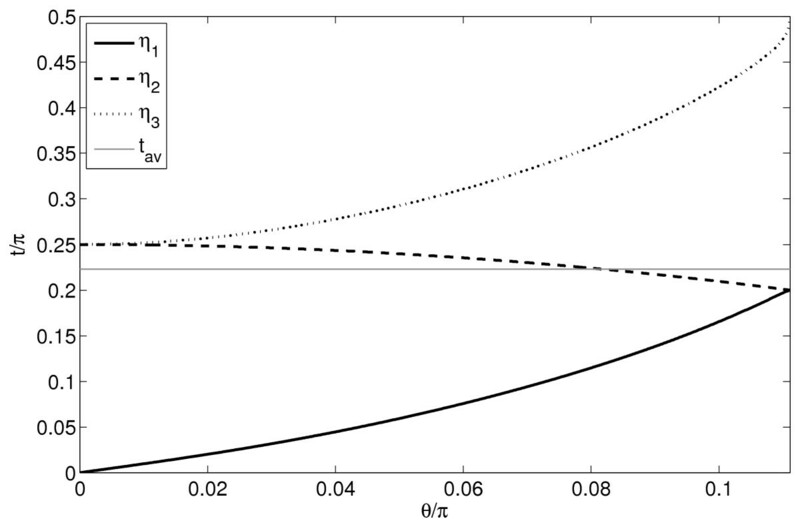 Due to small errors in the free surfaces, a small number of rays exits the collimator at angles larger than θ max . This happens at surface C, and therefore the chromaticity coordinates at θ > θ max are larger than the target values. Because the luminous flux of this light is very small, the irregularity is not visible. A similar irregularity is visible for the collimator with the block profile, only with a smaller chromaticity difference. LightTools model of the first collimator. LightTools simulation results for the collimator with Gaussian profile and a small second segment. LightTools simulation results for the collimator with Gaussian profile and a large second segment. 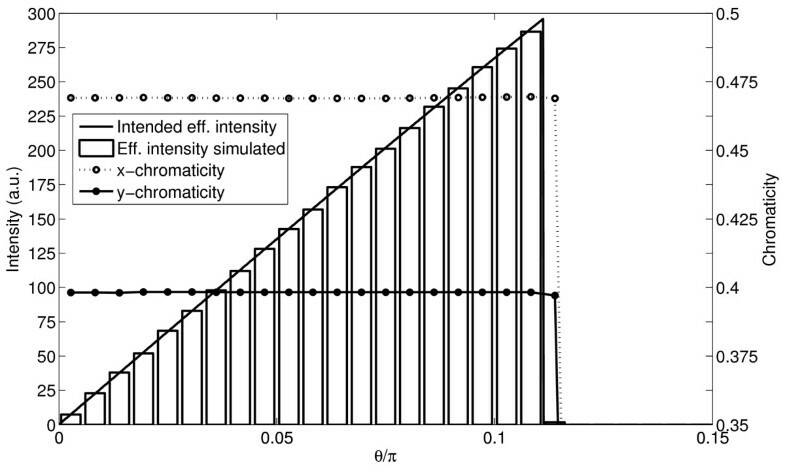 LightTools simulation results for the collimator with Block profile for LED02. 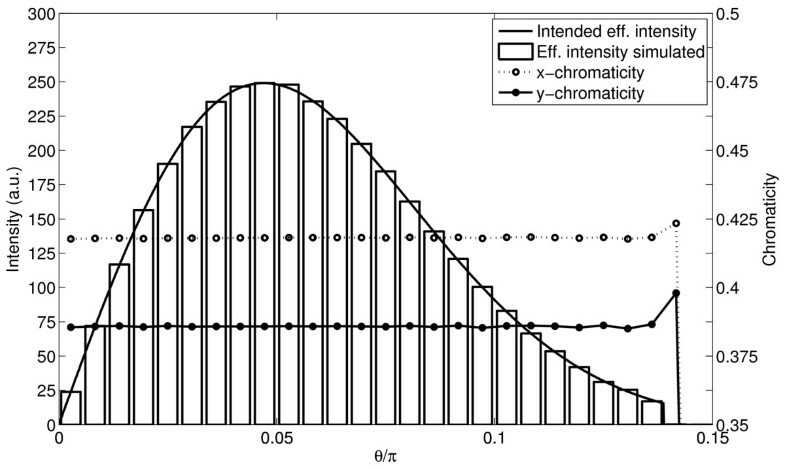 Apart from this small irregularity, the variation in chromaticity is very small. The maximum difference between the average chromaticity of the LEDs and chromaticity coordinates in the simulations are shown in Table 3. A color difference of 0.003 is considered very good by optical designers and is invisible for the human eye [8, 17]. The measured color differences in the simulations are comfortably below this value, thus the color variation in the beam is eliminated. We introduced an inverse method to design a TIR collimator that eliminates CoA variation for a point light source. 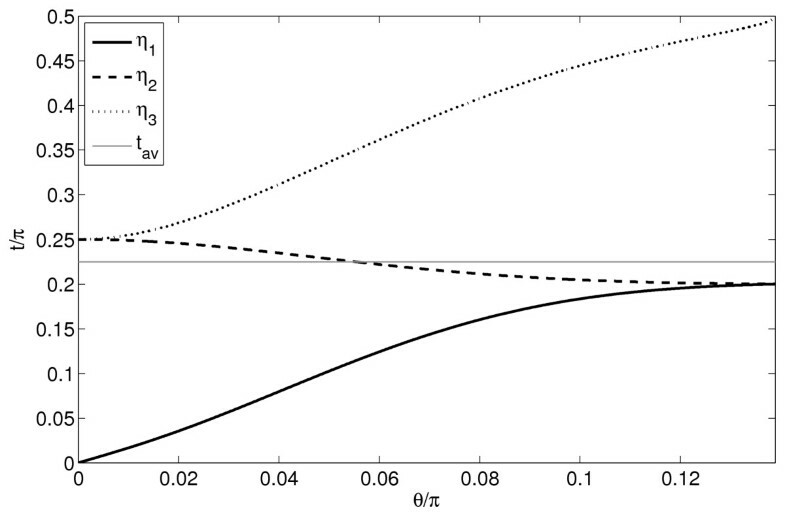 This method improves the method introduced earlier in  by producing collimators that closely resemble standard collimators and at the same time have more parameters for optical design. In Section 3 we discussed which choices for these design parameters give meaningful results. 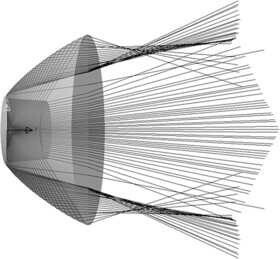 In Section 4 we tested the method and verified the resulting collimators with Monte-Carlo raytracing using the software package LightTools. The simulations show color variations that are not visible with the human eye. Unfortunately, LEDs are too large to be treated as a point light source. In future research, we would like to extend this method to take the finite size of the light source into account using iterative methods such as described in for example [18, 19]. This point source method will be an important building block in such an iterative method. The main idea in this paper was proposed by CP, who also prepared the manuscript initially. The proofs were elaborated by CP and JtTB. Technical assistance was provided by TT. All authors provided feedback on the manuscript, and read and approved the final manuscript. ORA LightTools product website [http://www.opticalres.com/lt/ltprodds_f.html] [Accessed May 31, 2013]. Instrument Systems - Light measurement [http://www.instrumentsystems.com/products/led-measurement-accessories/ledgon-goniophotometer/] [Accessed July 10, 2012].